I really like how they get local authors and illustrators to publish books in their own language, to further foster the love of reading and creating books in communities. I know I wanted to be an author because I was a bookworm, so I can imagine what the sparks coming out for other kids. Nepal is one of the countries that Room To Read works with, and in light of this year’s devastation in that region, Room To Read ambassadors have dedicated this year’s World Change Challenge to get the children of Nepal back to school and reading. 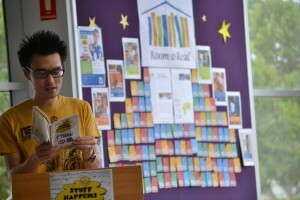 Room To Read hopes to raise $40,000 by 31st October. I know a lot of schools like to read for fun, but you can also read for fundraising too hehe. If schools are looking for a great, bookish cause around their own Book Week, then I can’t recommend this challenge enough. Fellow author ambassador and pal, Tristan Bancks has been a champion for the cause and has a fun video about some fundraising ideas and more information about the campaign. I remember going to a school where they had book busking, where kids would read out loud on the playground and kids would give them money in a hat. Now if only I had that when I was a kid haha. So this term, I’ll letting librarians and keen readers know about the challenge, every dollar counts and I mean it because one dollar equals one book for a child in Nepal. Along with the other author ambassadors for Room To Read, we hope to raise some funds and awareness for an awesome organisation, spreading the love and power of books around the world!